THERE ARE "GRAVE concerns" that the building of a flagship Primark store in Belfast city centre could collapse after an enormous fire broke out earlier today, the fire service has said. An evacuation was prompted after the fire broke out on the fifth floor of the landmark Bank Building on Castle Street at around 11am. The fire began on the fifth floor and steadily progressed throughout the entire building despite the fire brigade's efforts to tackle the inferno. 100 firefighters have been battling the blaze and 14 fire brigade appliances, a high volume pump, three aerial appliances and support units were at the scene today, Northern Ireland's Fire & Rescue Service (NIFRS) said. 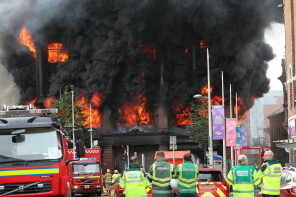 A Belfast Telegraph livestream earlier showed the fire raging in the heart of the building. Flames, which began on the top floor, appear to have engulfed the entire inside of the structure and huge plumes of smoke can be seen spilling into the surrounding area. Dozens of onlookers gathered behind a cordon to watch the firefighters battle the blaze. Firefighters have said that the building has been extensively damaged. Speaking to the BBC, senior fire officer Michael Graham warned that they have "grave concerns" that the building might collapse. "We need to ensure that our firefighters are firefighting in a safe and effective way and ensure they are not impacted by the collapse of the building," Graham said. "Our expectation is that the internal floors will collapse where the fire has been burning at its greatest intensity, but we actually hope that might help the overall structure." "But we certainly can't guarantee the structural integrity of the building at this time." NIFRS said in a tweet earlier today that firefighting will continue this evening. "Whilst the incident is ongoing, contingency measures are in place to ensure normal service delivery is maintained across Belfast," it said. The PSNI has this evening advised members of the public to expect continued delays in Belfast city centre tonight and into tomorrow morning while the fire service tackle the blaze. Road closures in and around the building will remain in place overnight. The public has been warned to anticipate traffic disruption in the morning and have been asked to leave additional time for their journeys. "The PSNI is continuing to support the NIFRS and work with other partner agencies to ensure the safety of the public and to minimise disruption in the area," the PSNI said. A spokesperson for Primark confirmed that the store was safely evacuated after the fire broke out and that they would be helping with investigations. 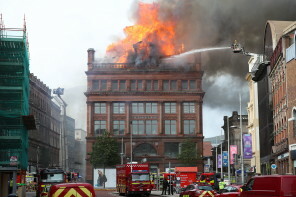 "We are deeply shocked and saddened by the fire today at our Bank Buildings store in Belfast city centre," Primark CEO Paul Marchant said in a statement. "The safety and wellbeing of our customers, colleagues and construction team is, of course, the most important consideration and we are truly relieved that all were evacuated safely. We would like to thank the emergency services for their swift response and ongoing actions. Our store is housed in an iconic building and much-loved by the people of Belfast. We would like to reassure our customers, colleagues and the wider community in Belfast that we are committed to working with the authorities and our building contractors to establish the cause of the fire. SDLP Councillor Tim Attwood has said the scenes at the historic building are "devastating". 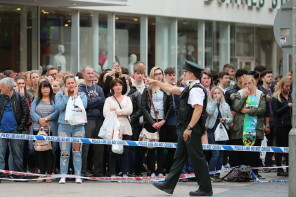 “The current scenes in Belfast City Centre are extremely worrying," Councillor Attwood said. My thoughts are with the staff and the emergency services who are currently battling to control the flames. Sinn Fein Mayor of Belfast Deirdre Hargey urged members of the public to keep a safe distance from the site. “I would also ask the public to avoid the Castle Street and Royal Avenue avoided whilst the incident is ongoing," she said. Emergency services at the scene and responding. I would urge the public to be cautious and to assist the emergency services in whatever way possible. The historic building is over 230 years old. It was bombed in 1975 and the resulting fire caused damage to parts of the structure. Primark has occupied the building since 1979 and it was undergoing major refurbishment works. 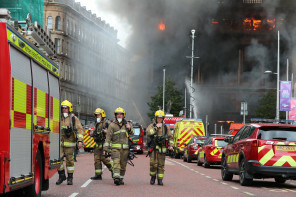 Email “'Grave concerns' that Belfast Primark store building may collapse after major fire”. Feedback on “'Grave concerns' that Belfast Primark store building may collapse after major fire”.